This lovely, old, original Farm House offers 4 bedrooms, 2 bathrooms, dining room, fully equipped, self catering kitchen and a private Braai and Lapa area set in a well manicured garden away from the hustle and bustle of the campers. All facilities of the game park are available to the House guests. The honeymoon suite is available to the Bridal Couple when they get married at Malonjeni or to supplement the farm house for extra guests. It consists of a double bed with bathroom-on-suite. The stablery is as the name suggests, ideal for a number of guests with Gents & Ladies sharing the caravan park’s ablutions. Rustic and ideal for Conference or Wedding guests who enjoy getting into the spirit of an African Adventure or for those wanting to join their camping friends or families. The Bush Whackers Inn is a self catering unit ideally suited to large groups such as Family re-unions, Church Groups, Corporate Team Building, Year-end Socials, etc. 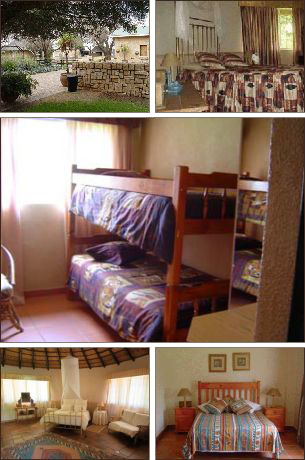 It consists of 16x Twin-Bed rooms, large self catering Kitchen and own Ladies & Gents Ablutions. Also doubles up as accommodation for Conference or Wedding guests.